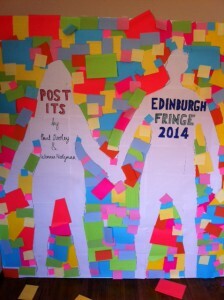 Festival Fringe, Edinburgh, Scotland in August 2014. 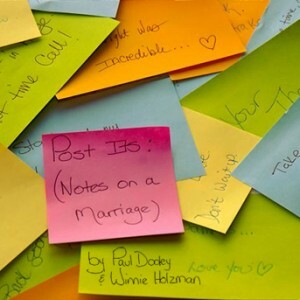 The hilarious, heart-breaking and inherently human tale of a couple’s journey that spans the duration of their lives together as read from little, colourful Post-It notes. From their young, vibrant days to becoming an elderly couple. From the therapy sessions, babies and mother-in-laws to ‘we need milk’, ‘home late’ and ‘I’m sorry’s’. He needs Viagra. She just wants a really big zucchini. This is a cleverly written play bringing to life the story of an ordinary couple with ups and downs we can all relate to in witty and sharp dialogue. Funny, fast paced, with a little tug at the heartstrings. Paul Dooley is an American actor, writer and comedian who has appeared in many movies and television productions such as Hairspray, Little Shop of Horrors and The Practice. His wife, Winnie Holzman is an American dramatist and screenwriter who, amongst many other accomplishments, wrote the book for the musical Wicked, based on the novel by Gregory Maguire. 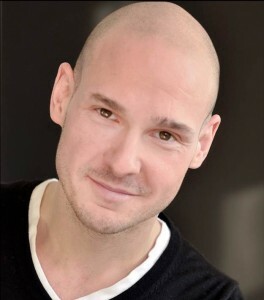 Ray Boulay is an actor, vocalist, musician and stage technician. You could say he is a child of the Arts! Ray studied at a FAME secondary school in Northern Ontario, Canada. And to learn the finer details of technical theatre and classical voice he attended Cambrian College, Sudbury, Ontario. It would appear that Ray loves to be in every facet of the performing arts! No stranger to Fringe Theatre, in 1996 Ray was Assistant Technical Director of the Sudbury, Ontario Fringe Festival and the following year he took the helm of the Technical Director. Currently Ray lives in Vancouver, Canada working as an actor and stage tech. Some of his stage performances have been: Riff Raff (Rocky Horror Show), Kenny (A Good Way Out), Husband -(Post Its (Notes On a Marriage)) and Dr. Spivy (One Flew Over The Cuckoo Cuckoo’s Nest). His television work includes Fringe, Arctic Air, Rogue, The Killing and The Intruders. 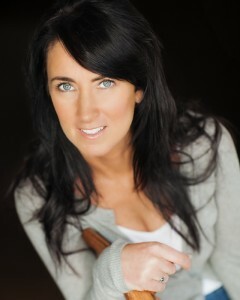 Alexandra Wilson has been involved in theatre for..well, forever! She has attended The American Academy of Dramatic Arts and along the way, has picked up an award here and there. Alex has had the privilege of portraying many wonderful and strong leading women, some of which are Daisy Lawrence (Return Engagements), Anita Merendino (Wrong Turn At Lungfish) and Girl aka Gabrielle Rejane (Ladies of the Camellias). One of her very favourite things is getting a script in her hands, diving into the character, pulling the character apart to then carefully build her back up! Going back to Scotland (Glasgow) this Summer for a vacation has turned into performing in the Edinburgh Festival Fringe in August! Taking her theatre company, The Page Theatre, to the EdFringe has already been a wonderful, creative and inspiring adventure! Post-It Notes, little square pieces of coloured paper, correct? To some, yes, but, to Ray Boulay and Alexandra Wilson, Post-It Notes are much more than that. Post-It Notes are what started a mutual love of theatre and most importantly a mutual love for each other. It was while, Ray and Alexandra, met on stage performing One Flew Over The Cuckoo’s Nest, where a plan was hatched to present new theatre to the Vancouver area. Since then they’ve become inseparable. Their love of theatre quickly grew into a deep and passionate love for each other. Both Ray and Alexandra come from strong theatre backgrounds that beautifully combine their strengths when working on projects together. That’s why when two actors perform a piece of work that embodies love and life the way ‘Post-Its (Notes on a Marriage)’ does, something special happens on stage. And when those two actors are truly, madly in love with each other, ‘Post-Its (Notes On a Marriage)’, becomes the perfect vehicle for true and authentic lovers to perform. When will we be performing? August 14 – 24, everyday! 3:35 pm. We have two shows a day on the weekends! Our show is 20 minutes, so you can easily pop over to see us! And if you want to take a Post-It Note home we’ll look the other way!! It’s easy! You can purchase your tickets a couple of ways. 1) At the door of venue 27. Look for us on the Royal Mile. We’ll show you fun things to do with Post It Notes and maybe a zucchini or two!